Who created the 1963 “March on Washington For Jobs and Freedom”? A gay black man named Bayard Rustin. Who composed the lion’s share of the music credited to Duke Ellington? A gay black man named Billy Strayhorn. Who was the poet and storyteller whose writings were the beating heart of the fabled “Harlem Renaissance”? A gay black man named Langston Hughes.Who was the greatest of all African-American blues singer? A black lesbian named Bessie Smith. Who was the greatest of all African-American stand-up comics? A black lesbian named Jackie “Moms” Mabley. Get the picture? That’s why the recent Oscar Hosting imbroglio over insistently heterosexual black comic Kevin Hart — who I doubt has so much as the slightest awareness of the above-noted information — is so annoying. For several years now attention has been paid to the disproportionate representation of white talent at the Academy Awards, in light of the myriad numbers of black and brown artists whove been given the go-by. “Oscars So White” its been called. And so following in the Hosting footsteps of Whoopi Goldberg and Chris Rock, Hart was chosen to host this year’s ceremonies. Said choice was immediately challenged by those familiar with Hart’s career and his many blatantly homophobic comedy routines (in one from 2009 he called a fellow performer a “fat faced fag.” In one from 2010, he said anoter performer’s profile pic looked “like a gay bill board for AIDS.”) By actual count Hart has made close to a hundred posts of an identical stripe on “social media.” Among them the most notorious being “Yo if my son comes home and tries to play with my daughters doll house I’m going to break it over his head ” No word as yet if Hart’s son has come out an in doing so required hospital treatment. Would a simple apology have saved the day. Some thought so. But not gay actor/comedian Billy Eichner, who tweeted, “You can tell its not just a joke — there’s real truth, anger & fear behind these. I hope Kevin’s thinking has evolved since 2011.” ait hasn’t, for in Hart’s view “I chose to pass on the apology. The reason why I passed is because I’ve addressed this several times. ” And of course he hasn’t. Ever. Perhaps aHart was thinking of an interwview he agev to Rolling Stone in 2015 in which he said that he wouldn’t tell such jokes again, “because when I said it, the times weren’t as sensitive as they are now.” Translation: “I’m not saying them again not because I disavow them but because I got caught the last time.” But with everyone from fellow black comics Michael Che, Nick Cannon, D.L. Hughley voiced their support for Hart clearly regarding homophobic jokes as worthy of defense and protection. Why notably whites like Kevin Klein (who played a gay man to great acclaim in In and Out — a film with an all-white cast) or Jerry Seinfeld (whose series never found space for an African-American actor to appear) support Hart is a mystery. Undoubtedly the “It’s just a Joke” defense plays into this, But as gay comic Billy Eichner tweeted, “You can tell its not just a joke — there’s real truth, anger & fear behind these [remarks]. I hope Kevin’s thinking has evolved since 2011.” It clearly hasn’t and there’s no sense it will in the future what with support form Che, Cannon, Hughley and their ilk. For like Hart they plainly regard “Black” and “Gay’ as entirely separate entities in which never the twain shall meet. They are of course quite mistaken. Not just because of “Moms’ Mabley — who offstage and sharkskin suited was known as “Mr. 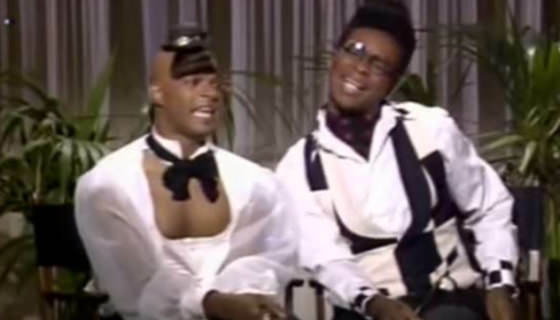 Moms” — but because of Damon Wayans and David Alan Greer whose immortal “Men On Film” sketches on “In Living Color” took what began as homophobic jokes so far as to attain surrealist heights in which they landed as foresquare tributes to everything black and gay. Two Snaps Up, girlfriend!